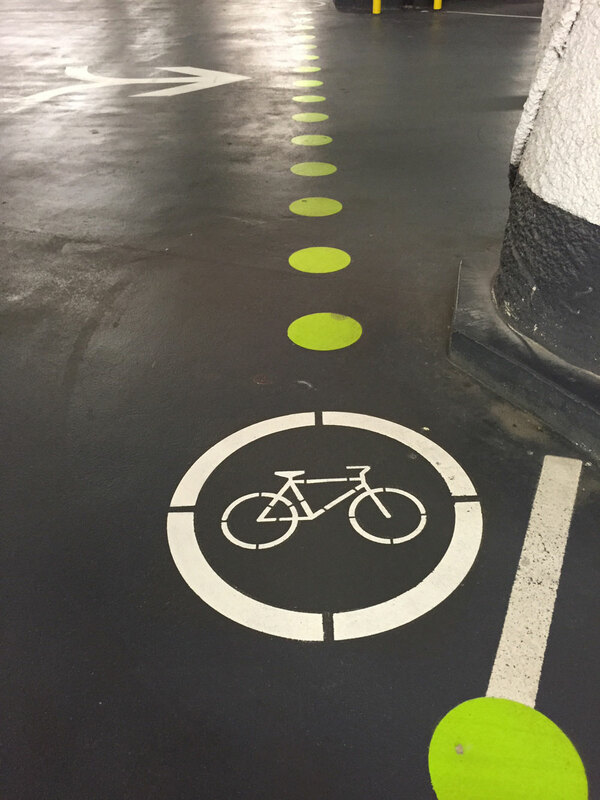 Does your business in the Sudbury/North Bay area require special markings for your parking lot or parking garage? From customization to giving your property more functionality with custom markings, our custom stenciling crews can complete any project you require. Looking to improve the aesthetic of your property or give it some unique markings for better functionality? Our custom stenciling services are the solution for you. We can give your building, parking lot or garage the unique look you want to convey with your brand, to make your property stand out or just add some functionality. With our custom stenciling services, our clients can incorporate virtually any logo, organizational label, or design of their choosing that can be painted onto their parking lot or property. If you have an idea to make your parking lot unique or more functional, we can make it happen. That being said, stancils aren’t just for branding and customization, we have stencils to and the needed equipment to create any kind of functional marking you need for your property. If you have handicap parking stalls, personal parking stalls, special parking zones, lanes, or different sections of your property that need to be labeled, we can take care of that for you. We can do any kind of custom stenciling you’d like to make your property look great and give it the functionality it needs. Why choose EverLine Coatings and Services over our competitors for your custom stenciling needs? When you choose EverLine, you get the EverLine advantage. Our professional crews have handled many unique stenciling requests in their decades of experience. Our custom stencil painters have seen it all and are ready to take on any job you can give them. When it comes to our paint products, we only use the best products on the market to survive the elements in North Bay, Sudbury and the surrounding areas. EverLine is also one of the largest paint purchasers in the region. By buying our supplies in bulk, we are able to save a considerable amount of money on the cost of our products. In turn, we are able to save our customers a lot of money and deliver much better value than our competitors. We ensure your stenciling will look great and last a long time. At EverLine Coatings and Services, we are considered the custom stenciling experts. The proof for this claim comes from our happy customers that we have been serving for decades. We understand the unique nature of each project and that no two customers needs will be identical. Because of this, we are proud to have some of the best custom stenciling painters in North Bay and Sudbury to ensure we deliver perfect results for your property every time. We have gone the extra mile to ensure that our crews will get you the quality and results you deserve for your property. We take the quality of the results, the integrity of your designs and markings very seriously. The safety of our custom stenciling crews is our top priority. Following these steps in preparation is key in ensuring the safety of our crews. This will also ensure that our crews are able to complete the project in a timely manner and provide a quality end result.